Hello friends, to all of you that are in the worst of the devastation from Hurricane Sandy, our hearts go out to you and your families. I had a phone call this morning from my friend who moved to Long Island to be near her only son, and they had to evacuate and leave their home on Sunday. They returned today to find everything ok. Her son had purchased a $70 pump and installed it in a crawl space to remove incoming water and because they didn't lose power, the pump did the job. Was so happy for them. We didn't get the high winds, but it did rain very hard and long. Everything is water logged, but compared to the damage in the states most affected, it was nothing. My card today is for the challenge at Saturated Canary #29 - theme, A Shaped Card. Krista has come out with a line of rubber stamps. I got this one at my LSS. They are totally unmounted (I like Cling Mount) and I thought pricey. But, that said, she is a beautiful stamp. Sue, this is so lovely. The card shape is wonderful, your image is beautiful, and the whole package is just amazing! Wow. Hugz! 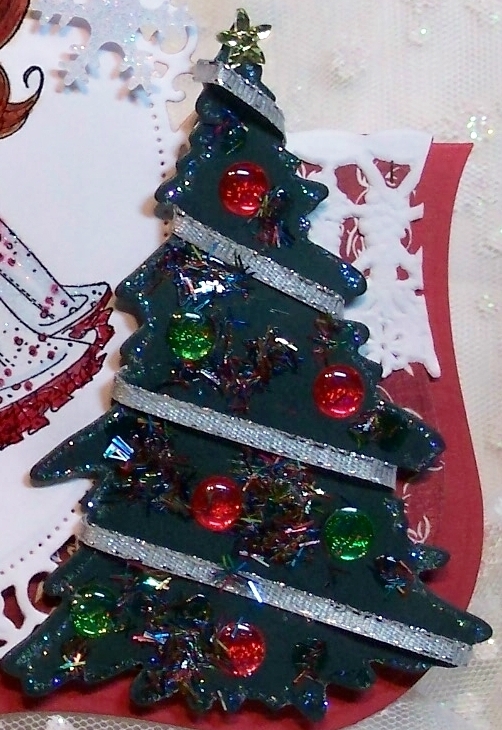 This is gorgeous Sue, I love the image and the beautiful detailing on the tree. 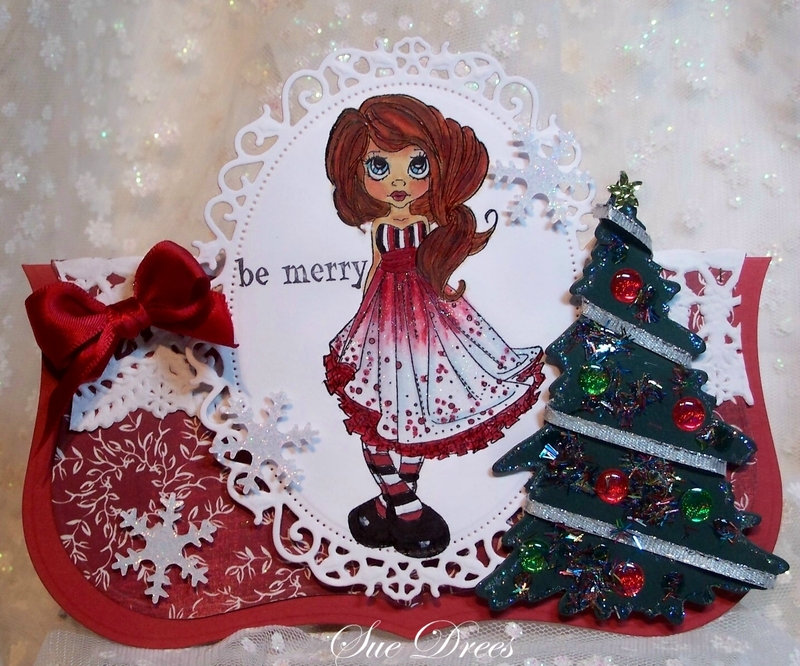 Yhis is beautiful Sue, love how you colored her dress and decorated the tree, great card! 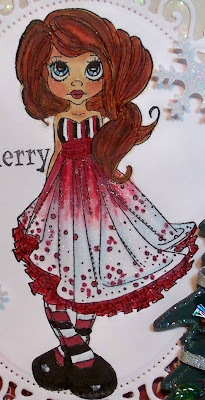 this is a very beautiful card Sue, love the way you colored her. Krista's images are a dream to color. You made a great design with the sleigh and Christmas tree. We are safe nothing at Myrtle Beach except wind and rain last week. So sorry we can't say as much for our neighbors to the north. Very glad you are safe. Imagine that a $70 expenditure could save all that damage. Gorgeous, I love this card, fabulous design and the image is so wonderful!